Bengaluru, Jan 12, 2019: Actor Prakash Raj, who has announced his decision to contest the Lok Sabha election from Bengaluru Central constituency as an Independent candidate, on Friday dubbed Prime Minister Narendra Modi’s move to extend 10% quota for the economically weaker sections (EWS) as “another jumla from the Modi government”. The actor-turned-politician, who started the #JustAsking series of questions to Mr. Modi last year, said though he welcomed the move, it looked like “yet another jumla” considering the Prime Minister’s track record of not honouring the promises made in the run-up to polls. “He has betrayed the people on the issue of creating two crore jobs every year and depositing ₹15 lakh in their accounts. He is misguiding people by making another promise on extending reservation to the economically weaker sections. It looks like a poll gimmick and people have to understand it,” he said. 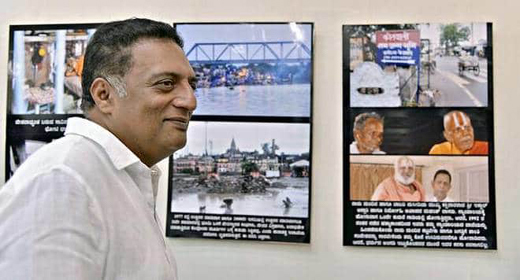 Mr. Raj, who was here to inaugurate a photo exhibition on ‘Religious Harmony in Ayodhya’ by Sudhir Shetty at the Karnataka Chitrakala Parishath, said the BJP would make construction of the Ram Mandir at Ayodhya as the central issue in the coming polls. “Ayodhya has remained underdeveloped because of politicisation of the Ram Mandir issue. The BJP has made it an emotional issue. When I visited Ayodhya recently, a mahant told me that by pitching two communities against one another in Ayodhya, politicians are sitting pretty in air-conditioned rooms,” he said. On contesting as an Independent and not identifying with any political parties, the multi-lingual actor said he was of the opinion that people’s voice should reach Parliament and their representative should ask questions. When asked about taking support of the Aam Aadmi Party (AAP) and meeting party leader Arvind Kejriwal, the actor clarified that he had not sought any support. The AAP, which is working in Bengaluru Central constituency from the past five years, came forward to support him, he said.